You may notice some changes. I kept the blog address but now want to rename my blog as Scrappy Crafts, because ... well... I just like it better. 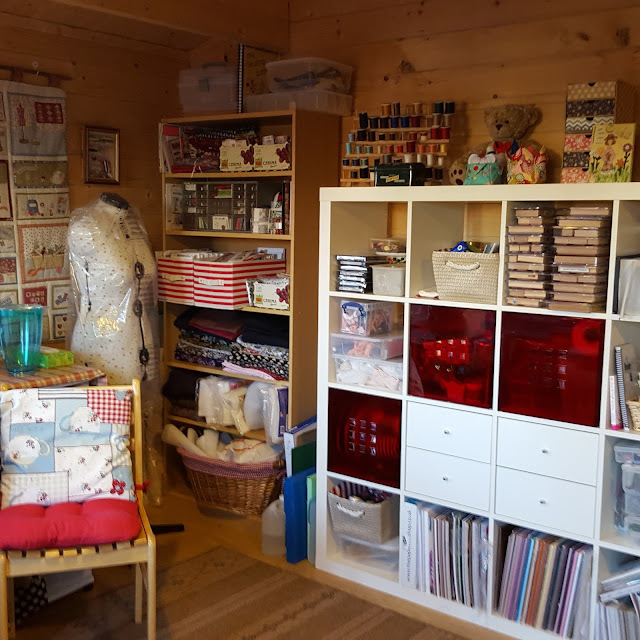 The thing about "scrappy" is that it applies to paper (scrapbooks, cards made with scraps of paper and whatever else) as well as scraps of fabric (patchwork, quilting, and more). I've also changed the background to a patchwork theme, but that will change over time, too. And in keeping with the them of "change", I've reorganized (yes, I'm doing American spelling...it's easier for me) my craft room (a cabin actually). I took out the long table in the middle of the room so I now have room to move around. Sewing section is enlarged and stamping section reduced now. The area to the left is all sewing now. Even the first column in the white Ikea sections is all sewing. A few months ago a man contacted me with a request to take his late mother's craft supplies and distribute them to my local Women's Institute. I had a whole estate-car full of boxes and bags, which I took to our WI meeting and offered them for free. Few takers, however, so I had about half left. Some things went to a charity shop and I kept some. Most of her things were for sewing: boxes of lace, buttons, ribbons, remnants, etc. Then of course, I've been adding "a few things" here and there as well, so now have quite a stash. Sewing is still my primary craft now. 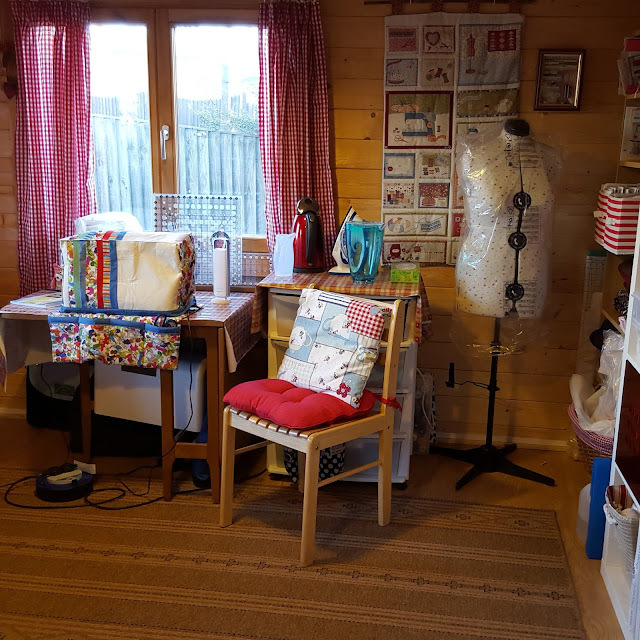 Although I belong to a Facebook group called UK Quilters, my quilting is really more small projects and patchwork, such as the sewing machine cover and tidy-mat, along with the wall hanging shown here. In the process of the reorg, I gave away tons of stamps, patterned paper, embellishments, ink pads, and more. As I went through things, however, it awakened a little spark of enthusiasm to get back into some of my papercrafting, so I'm glad I didn't just chuck it all out. I still have all my Stampin' Up stamps, a good bit of paper, and a few ink pads and art supplies. Still a few stamps, inks, dies, etc. left to play with! 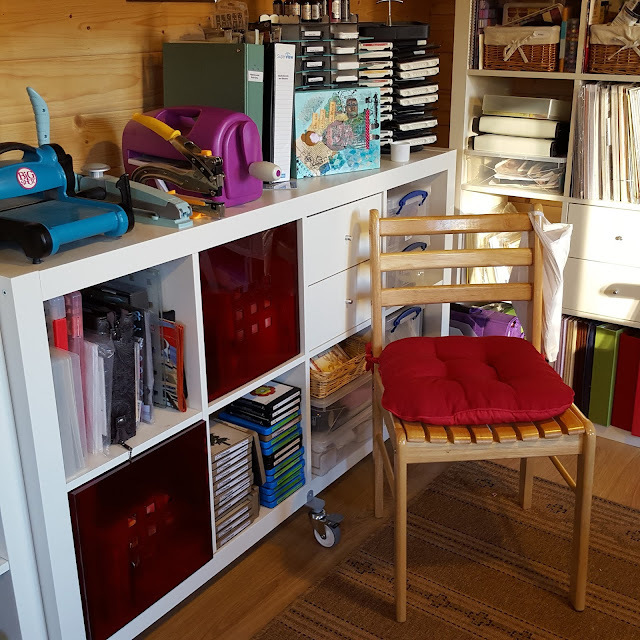 So, the crafting bug still lives and so does my blog, for now. Although I didn't get any comments after my last post, according to the statistics there were lots of views. For that reason, I'll carry on for a little longer. It's not yellow...the sun was shining in the window and the light was on! 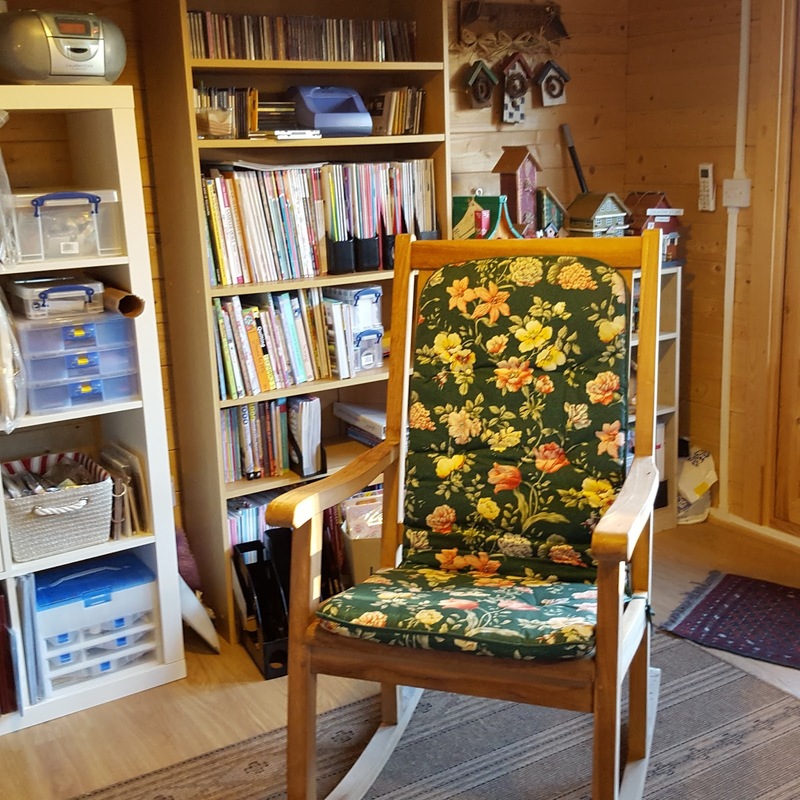 I even have a nice comfy rocking chair in my room now! I can sit and read my craft books and magazines undisturbed with a cup of coffee! I just found your blog this morning. Please carry on! It's lovely and inspiring. I love your cottage. All are beautiful! !...Love your blog!!... (I don't know much english but sometimes I use a tranlator)...I'm back soon!....God Bless! !